We at Geeky Hobbies would like to thank Cococucumber for the review copy of Planet of the Eyes used for this review. Other than receiving a free copy of the game to review, we at Geeky Hobbies received no other compensation for this review. Receiving the review copy for free had no impact on the content of this review or the final score. The indie game scene produces quite a few puzzle platformer games these days. While some are quite good, others are quite derivative and boring. To make a good puzzle platformer you need good puzzle design, tight controls, and something unique to distinguish yourself from all of the other games in the genre. Good games get all three things right while bad games fail in one or more of the aspects. What first drew me to Planet of the Eyes was the graphical style. Graphics are not enough to make a game good though so I was curious if Planet of the Eyes could bring more to the experience. While kind of short and easy, Planet of the Eyes is a satisfying fun puzzle platformer with a great atmosphere. 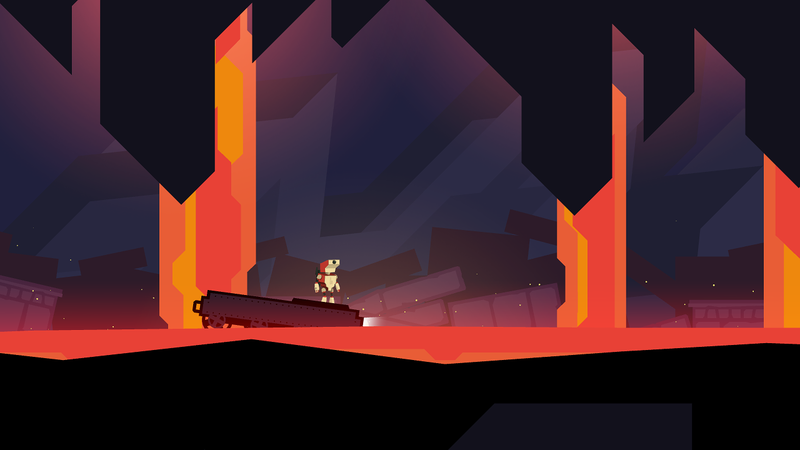 In Planet of the Eyes you play as a robot who was a passenger on a ship that crashed on a strange planet. As the robot you must explore the planet as it searches for a pulsing signal. Along the way you will learn more about the strange planet as well as the other crew members from your crashed ship. 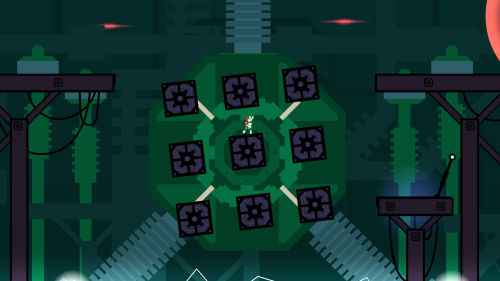 While Planet of the Eyes is a puzzle platformer, I would consider it as more of a puzzle game than a platformer. Most of your time will be spent solving the various puzzles you encounter throughout the game. Flipping switches, moving obstacles, and making jumps are just some of the many things you will need to do in order to complete your mission. The platforming in the game is used in some of the puzzles or as a gateway between different puzzles. The platforming is pretty straightforward and mostly just involves jumping to the next platform. While you need good timing on a couple of the platforming sections, the game usually gives you some leeway so you don’t always have to perfectly time every jump. As a whole Planet of the Eyes doesn’t bring a lot of new original mechanics to the table but it does a good job with the mechanics that it does use. The controls are both simple and precise. The game uses basic movement controls as well as a button to jump and a button to grab items/pull switches. With such simple controls, anyone with experience with puzzle platformers will have no trouble easily picking up the game. While I wish the robot moved a little faster, I had no other complaints with the controls since they are responsive. While the game is kind of on the easy side (see below), I had quite a bit of fun playing it. The puzzles are interesting and do a good job utilizing the environment. Basically if you have played a lot of puzzle platformers before you pretty much know what you are going to get out of the game. One of the first things that caught my eye with Planet of the Eyes were the visuals. Usually graphics in games don’t make a big difference for me. Unless the graphics are terrible or interfere with the gameplay, they aren’t a huge deal for me. This is the main reason I usually only briefly address them in most of my reviews. I have to address the graphics in Planet of the Eyes though because at times they are fantastic. While they don’t push graphics technology to its’ limits, you can tell that the game designers put a lot of work into the visual style of the game. I would say that the graphical style is kind of like Limbo and some of the other similar indie puzzle platformers. Unlike Limbo, Planet of the Eyes does a fantastic job with colors. Not being much of an artist myself I don’t really know how else to describe the graphic style other than saying that it is great and one of the best selling points of the game. In addition to the graphics the game does a good job building an atmosphere through the audio and story. The background music is well done and brings a life to the strange planet that you are exploring. While there is not much voice acting in the game, I have to say that is is surprisingly well done for a small indie studio. The voice acting comes into play through a series of audio recordings left behind by one of the passengers from the ship that crashed and is the main way that the story is told throughout the game. While the story is not a prevalent feature of the game, it is good enough to keep you interested in it. While Planet of the Eyes does a lot of things really well, one of the issues I had with the game was with the difficulty. After playing through the whole game I really didn’t feel that challenged. Planet of the Eyes is an easy puzzle platformer. A lot of the puzzles are pretty straightforward and you don’t really have to think outside the box in order to find the solution. I really enjoy puzzle platformers and play a lot of them so that might be part of the reason I found the game to be pretty easy. If you regularly play puzzle platformers there is a good chance that you won’t be that challenged by Planet of the Eyes. Being easy is not necessarily a bad thing. Due to the easier difficulty you can spend more time enjoying the beautiful graphics and interesting story/atmosphere. You will occasionally die in the game due to mistimed jumps but don’t expect to die a lot. You will probably breeze through quite a few sections of the game. When looking at puzzle platformers I like games to be in the moderately difficult range. I don’t like hard games that are frustrating since at times they just feel like a waste of time when you have to constantly repeat sections because you keep dying. While I prefer moderately difficult games I don’t mind easier games. While I would have preferred Planet of the Eyes to be in the moderate difficulty level, I am fine with the game being on the easier side. Other then the easier difficulty, the other concern I have with Planet of the Eyes is that it is kind of short. According to Steam I ended up spending around two hours to complete the game. I breezed through a large majority of the game though so if you have a little more trouble with the puzzle or platforming aspects of the game it could take around three hours to complete. Unfortunately outside of the single player campaign there isn’t much else to the game. There is no multiplayer. The game has fourteen achievements to collect but I don’t think they will take that long to get especially if you know what you have to do to collect them. I kind of wish the game had time trials or some other type of challenge mode. Planet of the Eyes just doesn’t have much as far as replay value. While I enjoyed the game quite a bit, I don’t know if I would really want to play the game again for a long time. Planet of the Eyes currently retails for $10. With the short length and the easy difficulty, Planet of the Eyes will probably not be worth that much for everyone. If you only somewhat like puzzle platformers or are very price conscious you might not think that the game is worth $10. Unless you hate puzzle platfomers though, I would recommend picking up the game at some point since you should enjoy it. If you really like puzzle platformers and don’t care about game length, I think the Planet of the Eyes is worth picking up. I had a lot of fun with Planet of the Eyes. The visuals are stunning and the game does a good job creating an interesting atmosphere. The controls are simple and I didn’t encounter any issues with them. Some of the puzzles are well crafted and do a good job utilizing the environment and the unique elements of the game’s world. I really only have two complaints with the game. First the game is kind of easy. I wish the game would have provided more of a challenge since I really didn’t have any troubles with any of the puzzles. The other problem is with the length. The game is pretty short at only around two hours long. Players looking for a long experience might be disappointed. If you don’t like puzzle platformers, you probably won’t like Planet of the Eyes. If you like puzzle platformers though the question becomes more of when to buy the game instead of if to buy it. Since the game is short, if that matters you should maybe wait for a sale on the game. Otherwise I think you should get quite a bit of enjoyment out of Planet of the Eyes. A fun game with good puzzle design. A little on the easy side. The game only takes around two hours to complete.